Marine protected areas – essentially nature preserves in the ocean – are meant to provide a safe harbor for sharks, rays and other ocean species being lost because of intense and often unregulated fishing. In a study published in Conservation Biology last week, we and other collaborators set out to quantify how populations of sharks and rays have changed over time at Cocos Island, a UNESCO World Heritage Site and one of the world’s oldest marine protected areas. Perched 550 kilometers (340 miles) off the Pacific coast of Costa Rica, Cocos is an isolated paradise. Jacques Cousteau called it the most beautiful island in the world, and its lush rain forests were the inspiration for Michael Crichton’s novel Jurassic Park. Underwater, Cocos teems with life. 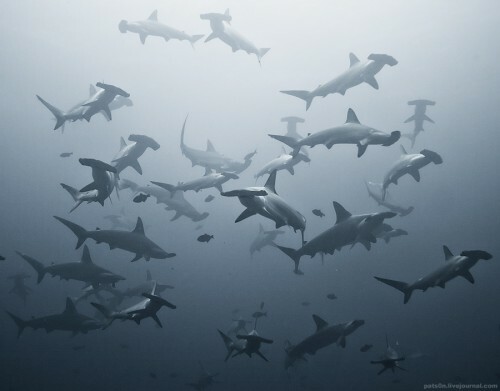 It is renowned amongst scuba divers as the best place in the world to swim with large schools of hammerhead sharks. 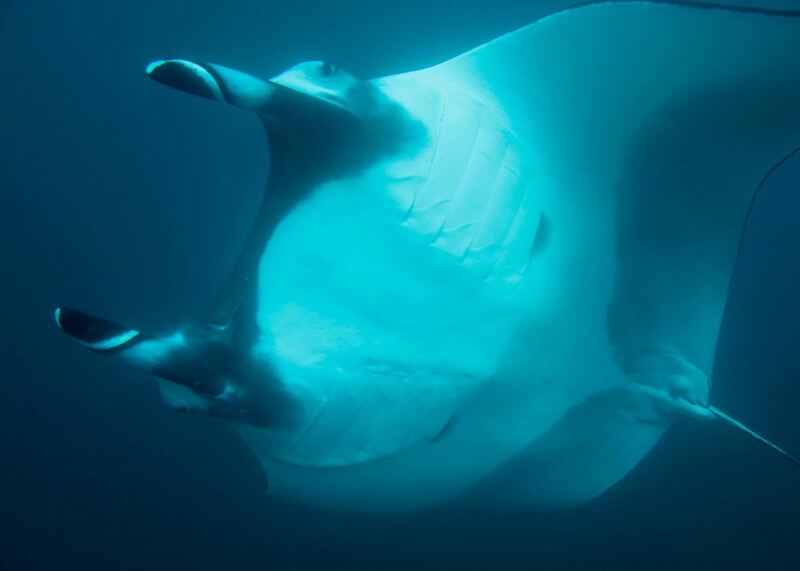 Giant manta rays, sea turtles, yellowfin tunas, and whales sharks are also regularly seen. And yet, there is trouble in paradise. We analyzed data on fish sightings reported after divemasters’ trips collected over the past two decades and found that all four of the most common shark and ray species at Cocos have declined significantly. Among the declines, we found the number of scalloped hammerhead sharks has dropped by almost half during that time. This tragedy is not altogether unexpected because hammerhead fins are highly prized in the international shark fin trade. These iconic sharks roam widely along coastlines in the eastern tropical Pacific Ocean, migrating between Cocos, Malpelo Island, and the Galapagos. Each of these islands is designated as a marine protected area, but hammerheads are still caught both within and outside of these areas. More surprising, was the precipitous drop in Cocos’s other common shark and ray species, which inhabit the protected area year round. 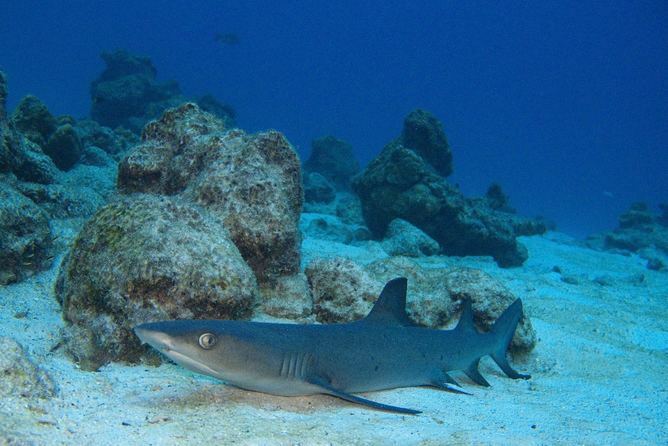 The whitetip reef shark is still seen on most dives at Cocos, but the number of this small reef-restricted species has plummeted by three-quarters. Ditto for the marble ray, a large stingray. Numbers of eagle rays, a large majestic pelagic species, have dropped by a third. All three of these species are thought to be reef-restricted and thus should be protected within the waters surrounding Cocos. Not so. The declines in the number of sharks and rays restricted to the waters surrounding Cocos are a clear indication that the protected area isn’t working. We also found that there have been increases in a few species. Not a single tiger shark was seen by divers at Cocos in our data until 2000. These large distinctive sharks are now seen on over 10% of dives. The abrupt increase suggests that some tiger sharks have simply set up shop at Cocos. Observations of the blacktip shark and the Galapagos shark also increased in frequency, so the Cocos marine protected area may be working for these two smaller reef-restricted shark species. One can point to the increases in tiger, blacktip, and Galapagos sharks as signs the protected area is working. This is probably partially correct. But it also reflects a larger shift in which species inhabit the waters around Cocos Island. In other words, increases in several species may be a sign of larger problems caused by changes in the ecosystem around Cocos Island. Higher numbers of some species, in particular large predatory species such as the tiger shark, may alter the relationships between species already present. On land, parks with inadequate enforcement against hunting are often referred to as “paper parks” – existing merely as boundaries drawn on paper but with little on the ground protection. This conveys a false sense of conservation. Perhaps understandably, illegal fishing is rampant within the Cocos Island marine protected area: the island is remote, enforcement has been limited, and shark fins are a hot commodity. Cocos is a 36 hour boat ride away from the mainland. This remoteness is part of what makes Cocos such a draw for divers from around the world, but it also makes the island a sitting duck for illicit fishing activities. Funding for monitoring and enforcement has been minimal. MarViva, a regional environmental NGO, has patrolled the island along with the Costa Rican Coast Guard since 2003 and caught illegal fishing in the process. Costa Rican laws make it tough to prove [illegal fishing] has occurred, however, and most cases to date have been dismissed in court. As a result, the illegal fishing continues. Many divers, however, recognize Cocos for the treasure that it is. Over the past 21 years, a group of dedicated divemasters working at Undersea Hunter, a live-aboard dive company specializing in trips to Cocos Island, has meticulously recorded every shark and ray they saw while diving at the island. Our study synthesized their observations of over 1.4 million sharks and rays. Without these data, it would be impossible to know how underwater life at Cocos is changing. Like many parts of the developing world, Costa Rican waters are without dedicated marine research surveys or comprehensive fisheries data. The foresight of Undersea Hunter’s owner Avi Klapfer to begin their monitoring program, and the dedication of the divemasters to continue it over two decades, is a testament to their love of Cocos. In this remote area, with no official monitoring, the Undersea Hunter data provide a window to see how sharks and rays have changed over two decades in this isolated and globally unique marine reserve. Watching sharks and rays at Cocos, it is hard to believe that there used to be even more of these beautiful animals. The reef still appears to be covered with them despite the declines recorded by the divemasters over the years. More effort needs to be directed towards enforcement and monitoring at Cocos. Recent efforts by environmental non-governmental organizations (eNGOs), including MarViva, Forever Costa Rica, and Conservation International are encouraging. The groups are now working together, with assistance from Oceans 5, to install a radar on the island to help control illegal fishing. The Costa Rican government also needs to get serious about prosecuting offenders. If Costa Rica is to maintain its status as a leader for progressive environmental policies, it needs to double down on efforts to protect its most iconic species and the national treasure that is Cocos Island.